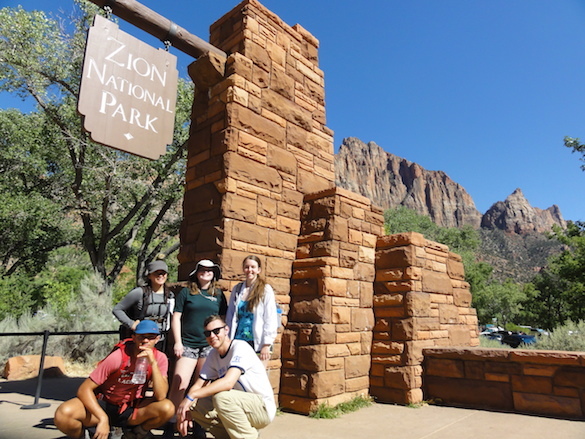 On June 27th, 2017, Team Utah from the Keck Geology Consortium visited Zion National Park. Before Keck, I had never visited a national park before, so I was really excited to see how a national park differed from a “regular” city/town park. To my surprise, when we first arrived, I felt like I was at Disney world again or at the state zoo (Minnesota Zoo). As we continued into Zion, I realized how commercialized Zion was. Gift shops greeted customers on their way in and out, park rangers available for information (but to me they seemed like tour guides), and the long line of people (waiting for shuttles). The amount of commercialization astounded me as I was not aware how popular a national park could be. After splitting up, part of Team Utah traveled to venture the Riverside Walk, where we had our lunch. We sat on the riverbank, on rocks and trees, under the shade. As I ate, I found myself often wondering about the formation of the landscape. I wondered how much things had withered away, and what was originally there and what had come later. After lunch, we walked the riverside path and we continued onto the Narrows. It was here where I really got a good look at how other people interacted with the landscape and everything else around them. Majority of the people would look up at the sky in admiration of the stone walls that created the “narrows” and kept the formation of the river. But, as I ventured deeper into the Narrows, I noticed that the only time people took in the scenery was in the beginning. Majority of the people interacted with the water, as they were trying to keep from falling while catching up with their groups. I feel that because of the Keck Geology Consortium program, my experience at Zion has been enriched by the knowledge I have acquired (while in the program). Since my participation in the program, I have become more conscience about the world around me. I wonder more about the history of where I go and what I see. Because of such thoughts, I feel that my knowledge deepened my meaning and experience at Zion. 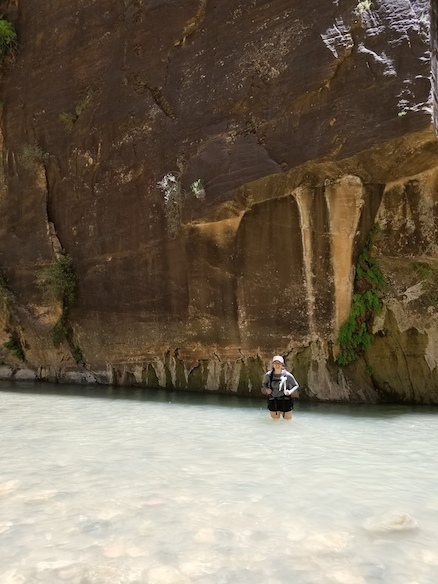 Pa Nhia stands in the Narrows in Zion National Park. Zion National Park is one of the most beautiful places that I have visited in the 19 years I have been on this Earth. The geology of the park was unlike anything I have ever seen before and I was blown away by the amount of people who were at the park. Geology plays a huge role in the National Park Service; since there are many national parks that are centered around geology. What astounds me is that people know how appealing these parks are to people and that there are those who know take advantage of this and make a living of it. When I think of the word “tourism,” I think of hotels on white sand beaches during prime summer hours. This, however, isn’t the case with a place like Zion National Park. There are the typical hotels and inns located in the town just outside of the park, but there are also shops that try to take advantage of people’s curiosity about the rocks and the geology. I am really happy to see this because it means that if a shop can sell someone a cool looking rock, then maybe they’ll start to ask questions like: “how did this form?” “what is this made up of?” “where can I find things like this?”. If even one person’s life changes because of looking at these tourist shops, I will be forever grateful because the seed of geology is being planted in their mind and hopefully it’ll grow into something breathtaking. Tourism is something that is crucial to the interaction between the public and geology and I hope it can help change lives for the better. Team Utah at the Zion National Park entrance. One of the biggest things I noticed at Zion National Park was what seemed to be the lack of interest in the geology. When people arrived at each location they would glance at the features surrounding them a few times before proceeding to a task that then took all of their attention. Where I was, this was either playing in or wading through the river, but I’m not sure about other locations. Luckily, whether people realized it or not, these types of tasks forced them to interact with the geology around them. I also appreciated that the Parks Services had audio about the park and its geologic features playing on the bus, which some people listened to but a lot seemed to talk over. I’m not sure what could be done to make the, what I see as impressive, rocks beat out the water on a scorching summer day like the one we visited during, but I hope my impression was skewed since I visited the river. Though, this was to view the impressive narrows and the striking cliffs as opposed to play in the water. 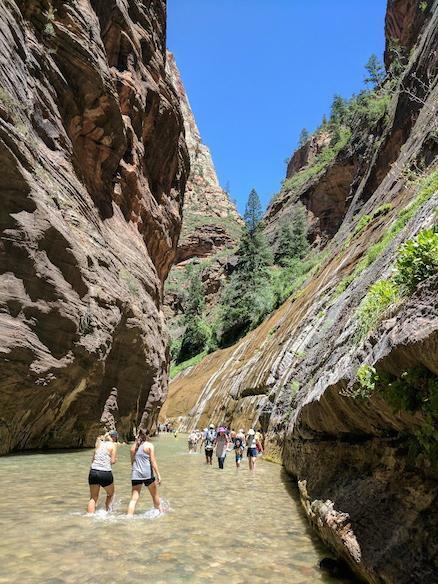 Hiking the Narrows at Zion on a 100+ degree day. Utah is a beautiful state filled with many different types of geology, from 20 feet high dinosaurs to brine shrimp that are less than a inch long. During my weeklong stay in Utah, I was able to experience most of what it was famous for. This included, Zion National Park, Salt Lake, Natural History Museum of Utah and the Geological Survey of Utah. My favorite was Zion National Park, because of its enormity and beauty. At Zion National Park the erosional effects of water on sandstone was easily seen, but the average park goer was not focused on the geology of the park. Instead thousands of people would stand in a theme park like line to get the perfect picture on top of these geological landforms. On the shuttle bus, a quick description of how Zion was developed was announced, but not everyone was paying attention to the 30 second long segment. Unlike other parks that I have been to, many of the people were rushing to get from one spot to the next, making for an almost chaotic atmosphere at times on the popular trails. The sheer number of people was overwhelming, but I had a wonderful time seeing enormous sedimentary structures and learning about Zion. Geology and society interact minimally, but not limited to if the visitor wants to learn more by asking employees of the park. People who visit the Natural History Museum are more open to learning how things happened in an interactive setting. While at the Geological Survey certain groups or companies go there with the purpose of learning about a particular core. The audience’s intention of visiting a certain place really determines how much knowledge that they will gain from that experience. It was really special to get to see the geological features of Black Rock Desert, Zion National Park, Salt Lake and what the Natural History Museum of Utah and Geological Survey of Utah does to interact and involve the public. 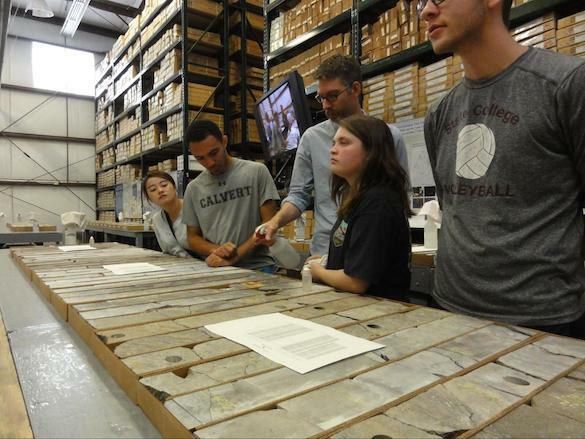 Team Utah learning about the cores stored at the Geological Survey of Utah. 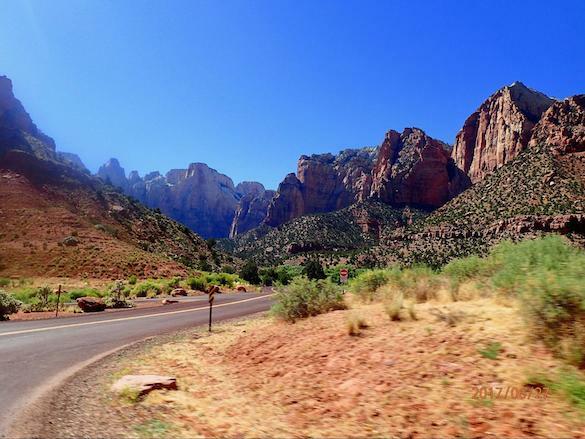 A picture of Zion National Park on the 100-degree day Team Utah visited. How does geoscience intersect with society? Water is one of the most basic needs to a human. When examining a map, it is easy to recognize that most major cities have been constructed in close proximity to a substantial water source due to the ease of access. When visiting my relatives in the small rural town of Biglerville, PA, I was never quite sure how they acquired their water. They are near no river nor suitable water source, yet water flows from their tap just as it does in my home, Baltimore. The answer for their water source is a well. Far beneath their town is an aquifer, which can be tapped for water. The aquifer is usually made of sandstone and water can remain in the sandstone because of the stone’s high porosity. To create the well, a pipe system is drilled into the porous sandstone and the water in extracted. The geologic phenomenon of the creation of an aquifer enables my cousins to live in their small rural town and sustains thousands of other towns which lay far away from usable surface water sources. This usage of aquifers as a water source has allowed people to move where they please and into more remote places previously believed to be uninhabitable because of the lack of water, however it has always been just below us. The presence of aquifers has helped humanity spread to the corners of the world. While in Zion, Sam Patzkowsky and I witnessed the aquifer process from an interesting vantage point. Usually the sandstone that comprises an aquifer is underground, however during our hike, there were sandstone slabs above ground in which it could be seen that water was seeping through. Most notable of these being weeping rock, a sandstone block from which water seeps thus personifying weeping.